Firm, meaty, yellowfin tuna steaks can intimidate novice cooks, but this high-quality tuna is easy to prepare. The mildly sweet flesh of yellowfin tuna, also known as ahi tuna, is often served raw in Japanese sashimi. You can pan-sear the outside of the fish briefly in a hot saucepan, leaving a slightly crisp crust on the outside, keeping the inside rare to medium-rare. Serve the tuna steaks thinly sliced to enjoy on top of a salad or on their own with a dipping sauce, like a soy ginger or spicy mayonnaise sauce. Season the tuna steaks lightly with salt and pepper. Sprinkle additional spices to your taste on them, such as coriander, chili powder, garlic powder or crushed red peppers. Coat a saucepan with olive oil and bring it to a medium-high heat on the stovetop. Add the tuna steaks to the pan once the oil is fully heated and sear for about 2 to 4 minutes per side. Tuna steaks typically are between 1- to 1 1/2-inches thick. Searing the steaks for 2 to 4 minutes leaves the steaks done to rare or medium-rare. For more well-done steaks, add a few more minutes per side, but lower the heat slightly to avoid over-browning the outside. Remove the tuna steaks from the pan and place them on a clean cutting board. Slice the steaks into 1-inch thick strips to serve. To crust the yellowfin tuna, pour sesame seeds or crushed black peppercorns on a shallow plate. Brush the raw tuna steaks lightly with olive oil and press them into the seeds or peppercorns, coating all sides before adding them to the pan to cook. 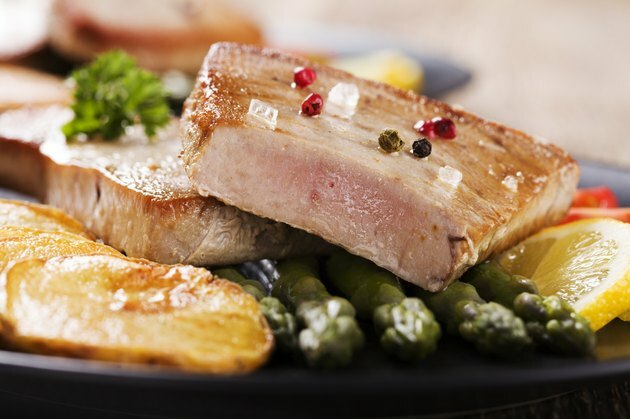 Infuse the tuna steaks with more flavor by marinating them for up to an hour in complementary flavorings, such as soy sauce and sesame oil with minced ginger and a splash of lime, or a dressing like balsamic vinaigrette. Avoid overcrowding the pan. Cook one yellowfin tuna steak at a time if necessary -- too many steaks in the pan won't allow the steaks to sear properly.